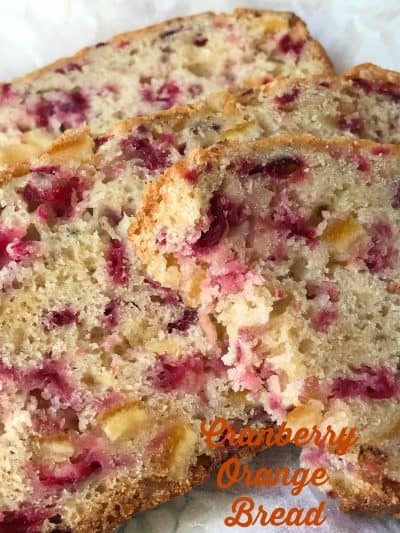 It’s that time of year again, time to dig out all of your favorite cranberry recipes. 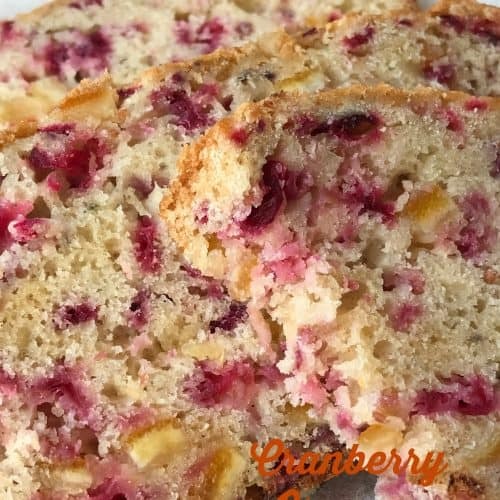 Everyone has a favorite cranberry recipe, a recipe that they make year after year. This is one of those recipes. I’ve been making this recipe for years, making slight changes from time to time. The recipe stays the same except I add nuts, a cream cheese ribbon layer or in this case, diced candied orange peel. 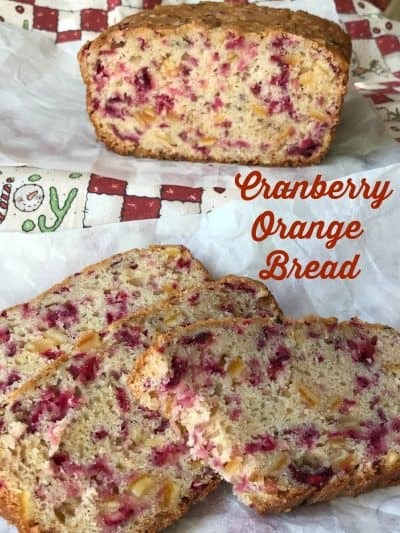 Cranberry Orange Bread is delicious, each and every time. For this recipe I simplified things a bit. I added candied diced orange peel from Paradise Fruit Co. No need to grate a fresh orange, or my knuckles for that matter and no nuts too chop either. 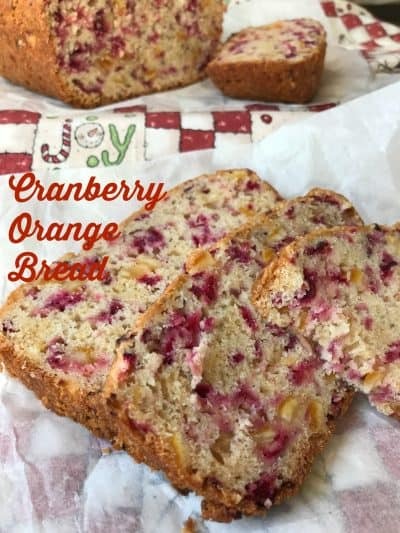 This recipe simply has chopped fresh cranberries and an eight ounce container of diced candied orange peel added to the batter. Nice and easy, lemon squeezy as my grand-daughter would say. These shiny scarlet, bouncy berries are grown in huge, sandy bogs on low, trailing vines. Cranberries grow wild in Europe and in the northern climates of North America, where they are also extensively cultivated, mainly in Massachusetts, Wisconsin, Washington and Oregon. The berries are harvested between Labor Day and Halloween. The peak market for cranberries is from October through December. Cranberries are usually packaged in 12 ounce plastic bags and can be refrigerated for at least 2 months or frozen up to a year. 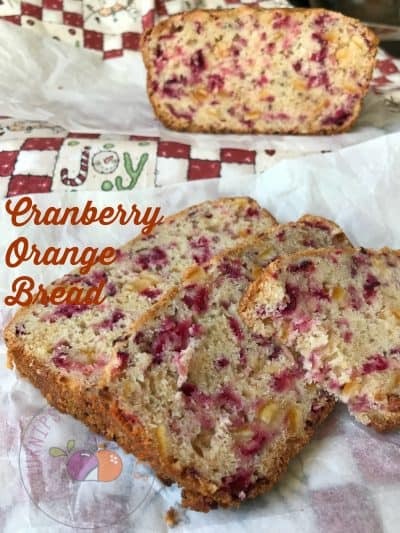 Besides the traditional cranberry sauce, this fruit also makes delicious chutneys, pies, cobblers, pie filling and many other desserts and baked goods. Because of their extreme tartness, cranberries are best combined with other fruit such as; apples, dried apricots, cherries or pears. Dried cranberries are easy to find, quick to eat and extremely versatile. They can be added to warm and cold cereals, salads, yogurt, rice and grain side dishes and baked goods such as cookies, muffins and breads. You can enjoy them as a snack as well. With the perfect blend of tart and sweet flavors, dried cranberries are a good source of dietary fiber and has a similar sugar content as other dried fruit, like raisins, cherries and blueberries. After harvesting, cranberries are sorted and washed to remove debris from the bog in order to ensure the highest quality dried cranberries. They are then frozen to retain their high quality and natural goodness, which helps to break down their internal structure and release the vibrant red coloring from the cranberry skin. The cranberries are most often sliced to release their natural tart flavor. Unlike other berries, cranberries are low in sugar and high in acidity. They require sweetening to be eaten. Cranberries are sweetened to replace what nature left out. The added sweetness helps to balance their natural tartness. Cranberries are dried to remove excess moisture for easy handling and packaging. Dried cranberries can replace any dried fruit, (raisins, cherries, blueberries) in recipes. *Both fresh and dried cranberries are becoming more popular to use in savory dishes also. Lightly spoon flour into measuring cup; level off. In a large bowl, mix together flour, sugar, baking powder, baking soda, and salt. Stir in apple juice, melted butter, and beaten egg. Fold in chopped cranberries and diced orange peel. Spoon batter into prepared pan. Bake at 350 degrees for 65 to 75 minutes or until top springs back when lightly touched in center. Cool in pan 15 minutes. Remove pan and cool on wire rack. Store cooled bread, tightly wrapped in the refrigerator. Here are more cranberry recipes that will make you smile:) Pear Cranberry Hand Pies, Cranberry and Lemon Shortbread Cookies and Sweet Potato Goat Cheese Cranberry Rounds.